A lavish look at the work, over nearly half a century, of one of the last of the great old-guard decorators. 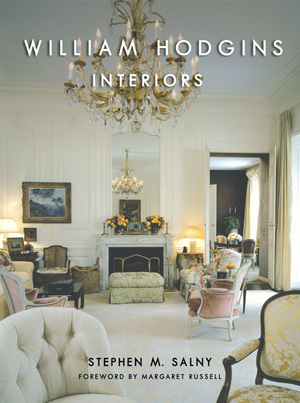 One of the deans of American interior decoration, William Hodgins follows in the footsteps of the legendary Billy Baldwin and also Sister Parish and Albert Hadley, for whom he worked early in his career. Based in Boston since the late 1960s, Hodgins’s work encompasses residential commissions from New England to Florida, as far west as California, and overseas. His interiors have been celebrated in the pages of Architectural Digest, House & Garden, House Beautiful, and other magazines and books. This is the first publication entirely devoted to his oeuvre, which spans five decades. Hodgins’s rooms are beautiful, thoughtful, and poetic; they are airy, light-filled spaces. They are also, in his words, as “extraordinarily luxurious as they can be in a quiet, understated way.” Handsome architectural detailing and a soothing palette work their magic and create visual flow; Hodgins is a master artist, his designs reminiscent of Merchant-Ivory films. A Hodgins interior is governed by white, and the decorator invokes the slightest of subtleties and different shades of white. For Hodgins, whites “reflect the quality of life and light in a room.” They “glow behind the art and furniture,” are restful, timeless, and age gracefully. Yet Hodgins is also noted for his judicious use of exquisitely clear and jewel-like colors: this skillful combination makes his interiors special, inviting, and comfortable. Among the forty notable commissions covered in this generously illustrated book are the private quarters of the American ambassador’s residence in Paris (1997), a pied-a-terre in a 1920s Beaux-Arts apartment building on San Francisco’s Nob Hill, several prewar cooperative apartments in New York City, and a considerable number of houses and apartments in the Boston and Washington, DC, areas and in Palm Beach, Florida. The majority of his commissions have been carried out for repeat and loyal clients, many of whom have commissioned him to decorate multiple homes. This presentation of his work will be valued not only by professional decorators but also by everyone seeking the best in interior design.